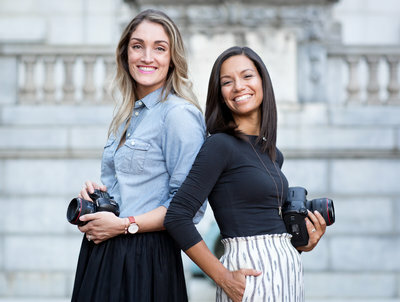 We’re Tara & Renata, wedding photographers and better together. We believe in love & marriage and it’s one of our greatest joys to photograph couples in this season of life. Enjoy scrolling through some of our favorite work here on the blog! At the reception, Lauren’s dad talked about how she pursued travel nursing years ago and he just knew that somewhere along the way, as she traveled around the country, his daughter Lauren would meet her husband. And he was right. While on assignment in Texas, Lauren met Patrick, and her days of travel nursing came to an end there. The two made the trek back to Maryland’s Eastern Shore, where Lauren grew up, for their wedding. A little further east from the Chesapeake Bay, is where Renata and I first met Lauren (known to us lovingly as “LP” in our college days) and so, being there to photograph her wedding was a huge privilege. It was so much fun to see her marry her best friend, and celebrate as they danced the night away at the Chesapeake Bay Beach Club. It was a perfect day and Lauren was absolutely stunning. LP and Patrick, we love you! So so happy for you both!